Crap, never saw the cover art until now. My bad. Clearly sleeping at the wheel. . . :/ R. Scott Bakker's eagerly anticipitated The Great Ordeal will be released on July 5th 2016! For more info about this title: Canada, USA, Europe. It's a nice cover that is stylistically similar to its predecessors. But did they really need to steal the face from the soldier on the cover of Alan Smale's Clash of Eagles??? 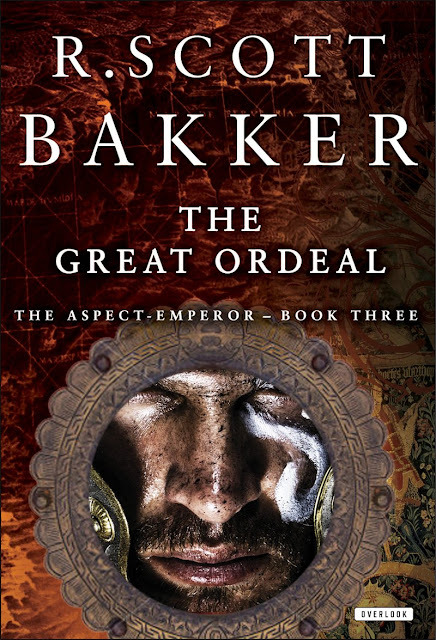 The much-anticipated third installment of R. Scott Bakker’s acclaimed series, The Aspect-Emperor. As Fanim war-drums beat just outside the city, the Empress Anasurimbor Esmenet searches frantically throughout the palace for her missing son Kelmomas. Meanwhile and many miles away, Esmenet’s husband’s Great Ordeal continues its epic march further north. But in light of dwindling supplies, the Aspect-Emperor’s decision to allow his men to consume the flesh of fallen Sranc could have consequences even He couldn’t have foreseen. And, deep in Ishuäl, the wizard Achamian grapples with his fear that his unspeakably long journey might be ending in emptiness, no closer to the truth than when he set out. The Aspect-Emperor series follows Bakker’s Prince of Nothing saga, returning to the same world twenty years later. The Great Ordeal follows The Judging Eye and The White-Luck Warrior, and delivers the first half of the conclusion to this epic story. Returning to Bakker’s richly imagined universe of myth, violence, and sorcery, The Aspect-Emperor continues to set the bar for the fantasy genre, reaching new heights of intricacy and meaning. The wait..... it is just tooo loooooong! Lol - we just noticed that last night at SA, Pat. Ridiculous - especially when they could tap SpiralHorizon to make a Bakker cover. along with the malazan books and rothfuss's books this series are the reason tat i think this site is missing out on being a leader in it's field. these 3 authors and their series are failed attempts, erikson might have a few credits more than the two other combined, but in all, these books are all about the author's ego. This series is the best thing to happen to fantasy in a long time. Can't wait! Woah - the slog of slogs is about over. This is the best series in fantasy lit today. Can't wait!